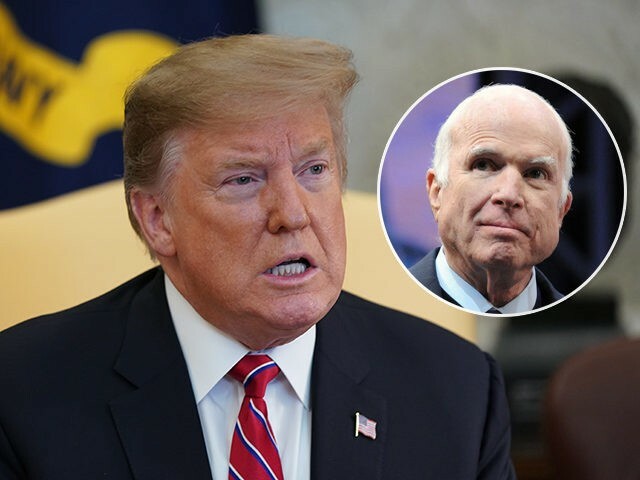 President Donald Trump continued criticizing the late Senator John McCain on Tuesday, as reporters questioned him at the White House. “I was never a fan of John McCain and I never will be,” he said at the White House. Trump reminded reporters that McCain essentially killed the vote to repeal Obamacare. Trump said that McCain indicated that he supported the bill but surprised Republicans by changing his mind at the last minute. “I think that’s disgraceful, plus there were other things,” Trump said. The president commented on McCain during a visit with Brazil President Jair Bolsonaro on Tuesday in the Oval Office.